How Often Should You Race During Marathon Training? Summer tends to be a mixed bag for road racers. For some, the summer is the time to back off after a competition-laden spring filled with races of all distances. Others ramp up in the summer, ready to hit the American road-racing scene—from the Peachtree Road Race to Falmouth to Bix and the Utica Boilermaker—after a spring of slogging through the mud. For roughly 350,000 American runners, summer is prime time to get ready for fall marathons; it's the time to establish the aerobic running base that will prepare them to attack the Queen's Distance. Be it Twin Cities, New York, Berlin, Chicago, Outer Banks or any of the more than four dozen other global marathons this fall, how to approach the build-up is on the minds of many. 1. How fit are you at the beginning of your marathon preparation? 2. How much racing did you do prior to your marathon build-up? Whether you are on the "crash-course" 8- to 10-week marathon build-up or a more extended traditional 14- to 16-week plan, marathoners generally fall into two categories of fitness: those who are fit at the start of marathon training, and those who aren't. The fit folks have usually just finished a racing season, and, a month into their marathon preparation, become as fit or fitter than they were during their previous cycle. 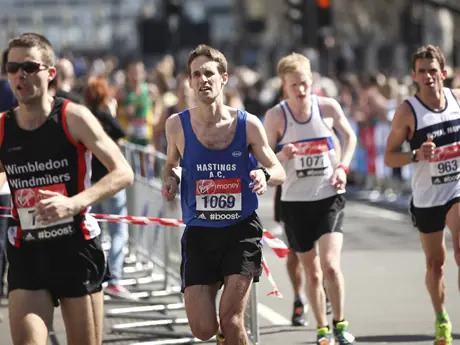 Fit-at-the-start-of-training runners should race less frequently during the marathon build-up—1 to 2 times max—because over-racing during the ramp-up can put these athletes at a higher risk for being stale on race day. It seems like a paradox, but racing too frequently can make you overly fatigued and therefore not well prepared for marathon day. More: Are You Racing Too Much? ZAP Fitness is a Reebok sponsored nonprofit facility that supports post-collegiate distance runners in Blowing Rock, North Carolina. ZAP puts on adult running camps during the summer, and is available for retreats all year. The facility has a state-of-the-art weight room, a bio-lab for physiological testing and a 24-bed lodge. Coaches at the facility include two-time Olympic trials qualifier Zika Rea, Ryan Warrenburg and head coach Pete Rea. Visit zapfitness.com, check out ZAP's Facebook page for more info, or call 828-295-6198.